When considering the removal of the thymus gland it’s notable that the ancient Greeks knew of its existence but could only guess at its purpose. Possibly because of its central location in the upper chest between the lungs and next to the heart, they thought it might be the seat of the soul or the emotions. It wasn’t until 1961 that medical science began to understand the actual functions of the thymus and its crucial relationship to the early development of the immune system. The difficulty with any minimally invasive approach is to accurately approximate the best operative outcomes of the open approach. The challenge with the thymus is to achieve a complete resection with the thymic horns that sometimes extend into the neck. This photograph shoes the H-Like shape of the thymus with the horns being demonstrated. The robot can be seen in the top-left of the background. In effect the thymus is the school for T-cells. T-cells (T-lymphocytes, where the T is for thymus) along with similar B-cells produced in bone marrow are a critical component of the body’s immune system. Each T-cell carries molecular receptors, something like locks for unique keys that match a specific foreign substance known as an antigen. If a T-cell lock meets its antigen key, it captures and kills it. This is how the body fights the invasion of antigens such as viruses, bacteria, certain poisons and anything else recognized by T-cells. The thymus is the organ that programs the T-cells to do this job. There is another crucial aspect to the job of the thymus – preventing the body’s immune system from attacking itself. It is quite common for the portion of the thymus that responds to an antigen to produce a T-cell version that could attack the body’s own proteins. This potential danger is identified by another segment of the thymus and eliminated. In training useful T-cells and removing harmful T-cells, the thymus maintains what is called central tolerance, the ability of the body to defend itself against foreign substances without also attacking its own tissues. The thymus is most active in performing this role very early in life. In fact, while still a fetus an effective stock or in a way, a library, of T-cells is built using antigens found in the mother’s blood. The process continues through childhood and into adolescence, as the body encounters many new antigens and the thymus reacts to build corresponding T-cells. Eventually as the body goes through puberty the stock of T-cells and the range of antigens covered reach a point where the thymus no longer needs to be very active. At that point it begins to slowly atrophy. It reacts to the high levels of adolescent hormones and shrinks in size, a process that then continues through the rest of life. Recent studies have shown that the thymus continues to produce T-cells into old age, although at a much reduced rate. No one suggests removing a thymus without imminent cause, however there are serious autoimmune diseases and cancers that affect the thymus and it is sometimes necessary to remove the organ in a procedure called a thymectomy. Fortunately, for all practical purposes removal of the thymus from an adult has minimal effect on the immune system. The most common reasons for a thymectomy are related to myasthenia gravis (MG), an autoimmune disease that causes abnormal muscle fatigue. People with MG typically have little energy and suffer from weak, droopy or quickly tiring muscles. For example one or more sagging eyelids are often symptomatic of myasthenia gravis. Because of its connections with the immune system, myasthenia gravis sometimes produces a greatly enlarged thymus (hyperplasia), which in turn is prone to become affected by thymoma, a cancer of the internal surface cells of the thymus. It has been found that removal of the thymus can head off development of thymoma and substantially alleviate (though not cure) the effects of MG. Unfortunately, the link between myasthenia gravis and the development of a thymoma is not well understood. About 15% of myasthenia gravis patients develop thymoma, which can be either benign or malignant. Why the benign thymoma turns malignant (with probable spread by metastasis) is also not well understood. Early-stage thymoma cases are commonly treated with a thymectomy. Later stage thymomas and especially malignant thymoma are typically treated with chemotherapy or radiation, which may be followed by thymectomy. Because of its central location in the upper body and especially its nearness to the heart, the thymus presents specific challenges for surgery. In fact, there are occasions when the thymus may be removed simply to provide unobstructed access to certain segments of the heart. There are three standard surgical approaches to the thymus: The first is transsternal, which cuts through the sternum or breast bone. Sometimes referred to as ‘cracking the chest,’ which is essentially the same approach used for open heart surgery. Another approach to the thymus is transcervical, which proceeds from above the thymus through a small neck incision. Finally there is the transthoracic, which approaches the thymus through multiple small incisions on one or both sides of the chest. For obvious reasons the transsternal approach is the most traumatic, but it does offer the surgeon an open and visually clear view of the chest and thymus. The transcervical neck incision, although less traumatic than a transsternal incision, is limited by the ability of the surgeon to see all of the thymic tissue around the heart and nerves. Much the same can be said of the transthoracic approach, although as we suggest below, this may not be a decisive factor. 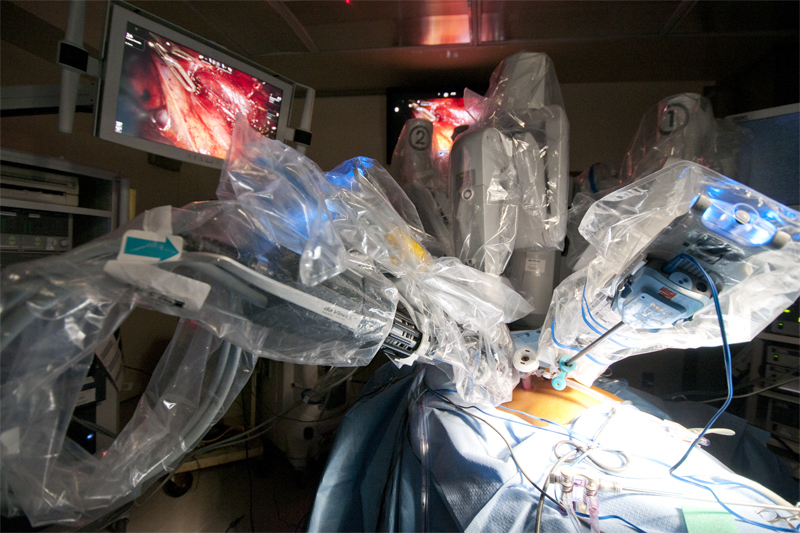 The robot, with its articulating instruments, is an optimal tool for operating in the tight spaces of the chest cavity. A robotic thymectomy requires dissecting the gland around the lung, off of the heart, around some very important nerves, and up into the neck. Many transthoracic thymectomies are performed with a video assisted thorascopic surgery (VATS), where a video camera is used to see the surgical field, in this case the thymus and surrounding tissue. This type of procedure generally uses small incisions in the chest for the camera, surgical instruments and perhaps a larger incision for access by the surgeon’s hand. The approach is sometimes called minimally invasive. With the advent of robotic surgery, which is truly minimally invasive, there is another transthoracic option for thymectomy that can achieve the effectiveness of a transsternal approach without the trauma associated with going through the breast bone. Using a da Vinci Surgical System, robotic equipment manufactured by Intuitive Surgical, Inc., surgeons can work with incisions of a few centimeters, about the size of a dime. They use the miniaturized instruments attached to robotic arms and highly flexible joints to perform the most delicate aspects of a thymectomy. Guided by a high resolution, three-dimensional thorascopic video camera, the operating surgeon can visualize the entire thymus. This can be crucial, especially to see the exact position of the thymus tissue and avoid cutting the nearby bilateral phrenic nerves, which among other things provide motor control for breathing to the diaphragm. Good vision is also essential for completely dissecting the thymic horns, the top portion of the thymus that extends into the neck. The relatively small size of the thymus, its close proximity to vital organs (lungs, heart, nerves), and the desire for a thymectomy with complete removal of thymus tissue provide a good example procedure to showcase the advantages of robotic surgery. 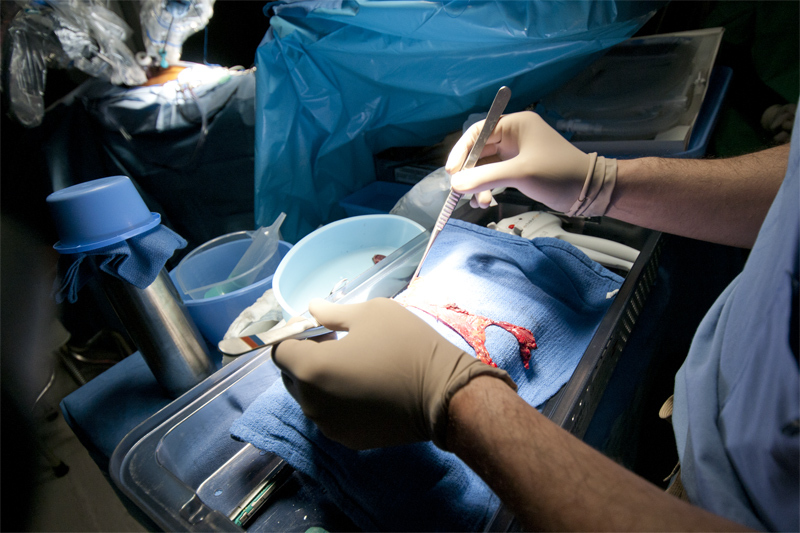 In particular, the combination of the surgeon controlled camera, the computer enhanced clarity of the image, and the dexterity of the miniaturized robotic surgical instruments easily overcome the tight operating space around the thymus and provide the precision necessary to safely navigate a complete thymectomy. For the patient undergoing a robotic assisted thymectomy, the biggest advantages accrue from the minimally invasive approach and the precision of the internal surgical work. The difference in recovery between an operation that requires four or five small incisions on the side of the chest versus an operation that requires cutting through the sternal bone is enormous. In effect smaller incisions, less internal cutting and precise movement of instruments typically means less post-operative pain, faster recovery and less time in the hospital. Multiple studies now demonstrate that video-assisted thoracoscopic surgeries are less invasive than transsternal approaches, can significantly shorten the postoperative hospital stay, and have superior cosmetic results (smaller scars). For example, a robotic thymectomy compares well with the transcervical (neck incision) approach. Both are considered minimally invasive and have similar success rates in operation safety, recovery time and long-term effectiveness. However, some people prefer the robotic approach to avoid the neck scar from the transcervical approach. Since the first robotic thymectomy in the United States was performed at our institution ten years ago, the results collected from high-volume surgical centers using minimally invasive techniques in comparison with traditional (transsternal) surgery increasingly demonstrate that the long-term complete remission rate for myasthenia gravis is similar. However, where a myasthenia gravis condition is complicated by an early stage thymoma (cancer of the thymus), the basic operation to remove the thymus becomes a radical (extended) thymectomy, where it is essential that thymic tissue is completely removed to prevent the recurrence of cancer. This is a case where some surgeons find the robotic thymectomy controversial. It is suggested that without using the maximally invasive – and visually open – transsternal incision some thymic tissue might be left behind. This was a criticism most often heard when we introduced the robotic technique ten years ago. Since then the robotic equipment has undergone years of further development and improvement. Surgeons performing the robotic surgery have developed more refined procedures and overall the training and experience level of surgeons skilled in robotic technique has increased. The result is that multiple studies throughout the world now suggest the robotic technique has similar effectiveness and remission rates as the transsternal approach. Even with a small sample and short follow-up, robotic extended thymectomy appears to be an effective treatment for early-stage thymomas. For the patient undergoing a robotic assisted thymectomy, the biggest advantages accrue from the minimally invasive approach and the precision of the internal surgical work. The difference in recovery between an operation that requires four or five small incisions on the side of the chest versus an operation that requires cutting through the sternal bone is enormous. The result is that multiple studies throughout the world now suggest the robotic technique has similar effectiveness and remission rates as the transsternal approach. Even with a small sample and short follow-up, robotic extended thymectomy appears to be an effective treatment for early-stage thymomas. Achalasia is a problem with the nerve cells that transmit messages to the esophageal musculature characterized by increased lower esophageal sphincter (LES) pressure, diminished or absent peristalsis in the distal portion of the esophagus composed of smooth muscle, and lack of a coordinated LES relaxation in response to swallowing. The ultimate cause of this degeneration is unknown. Autoimmune disease or hidden infection is suspected. A Laparoscopic or Robotic modified Heller myotomy is considered the standard of care for palliation of this incurable but benign disease. Sublobar lung resection and brachytherapy seed placement is gaining acceptance for T1 non-small cell lung cancer (NSCLC) in select patients with comorbidities precluding lobectomy. Our institution first reported utilization of the da Vinci system for robotic brachytherapy developed experimentally and later applied to high-risk patients. Robotic brachytherapy seed placement is a feasible adjuvant procedure to reduce the incidence of recurrence after sublobar resection in medically compromised patients. Tailored robotic seed placement delivers an exact dosing regimen in a minimally invasive fashion with equivalent precision to open surgery. How the lung is accessed matters a great deal. A robotic minimally invasive surgery leaves only tiny incisions, which heal more quickly and with less pain. The fine motor control of the robotic instruments makes it possible to perform certain actions, such as lymph node dissection, one of the typical surgical procedures for the lobectomy, with greater precision and speed than if it were done by hand. The end result is that while a robotic lobectomy usually requires at least as much time as an open procedure, it is generally less traumatic to the patient. A paraesophageal hernia is a type of hiatal hernia where the junction of the stomach and the esophagus remains in place, but part of the stomach is squeezed up into the chest beside the esophagus. Surgical repair of paraesophageal hernia is generally recommended for symptomatic patients however the operative strategy remains a matter of debate, and there is not a single technique guaranteeing uniform long term success. Our techinique is a paraesophageal hernia repair with a combination of laparoscopic and robotic technology in order to ensure the best dissection as well as technical fixation of the mesh to the diaphragmatic defect. The antireflux procedure is determined by the intraoperative need to displace the gastroesophageal junction during reduction of the hernia as well as preoperative studies. When a sympathectomy results in the body starting to sweat copiously at another location, compensatory sweating; the cause of this change isn’t fully understood. Consequently it should not be surprising that the results of a graft to reverse a sympathectomy are not always fully predictable. The procedure is still relatively new and there are questions about the permanency of the graft, the regeneration of appropriate nerve signals, and whether the body will develop other side effects.